Rayon was first invented in 1855 but didn’t make it into consumer clothing until the early 1900s. Rayon is a semi-synthetic textile fiber meaning it’s sourced from naturally occurring material, but the process of making it is synthetic. 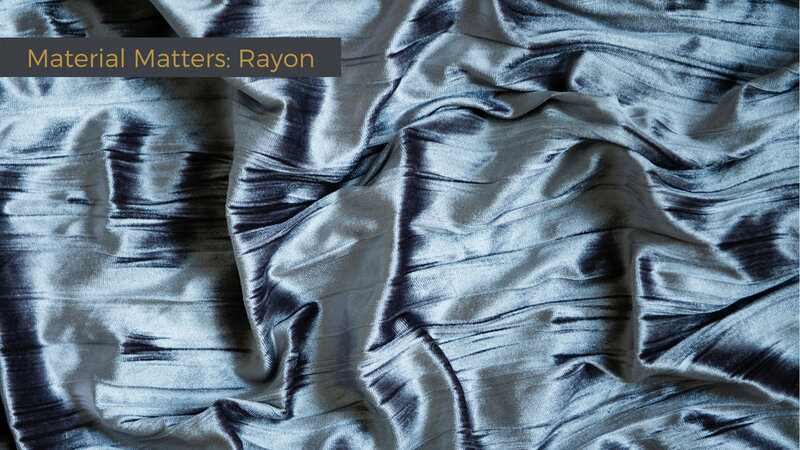 Rayon is derived from cellulose harvested from wood pulp, creating a material, that depending on its manufacturing process, can feel like silk, wool, cotton, and even linen. Because rayon is made from natural fibers, it is highly absorbent, unlike other man-made fabric materials. This absorbency can be great for athletic clothing but this also means it tends to stain quite easily. Rayon has a similar drape and feel of nylon but doesn’t insulate body heat well, making it cool and light to the the touch, perfect for more summery clothing or pajamas. For a stint in the early to mid-2010’s Rayon (Viscose specifically) was miss labeled by many large U.S. stores like Nordstrom, Bed Bath and Beyond, and J.C. Penny as Bamboo, which the FTC felt was misleading consumers to believe the fiber was more organic than it actually is. The mislabeling came about as a decent amount of rayon producers use bamboo as their source of cellulose to produce the fiber. This lead to fines from the FTC for many of these companies. While the source of Rayon is more naturally occurring, its development process uses carbon disulfide which is extremely harmful to those who work in Rayon factories and is a harmful pollutant. While the levels of this chemical are far from hazardous by the time it reaches consumer products, it’s inclusion in the manufacturing process does give eco-conscious consumers pause when looking at tags for new clothing. The main difference between the types of Rayon resides in its ability to retain its integrity when wet. Viscose Rayon tends to lose its shape when wet, and has the lowest elastic strength of all the common rayon variants, this leads to garments that include Viscose to be dry clean only. Modal Rayon is much more tolerant to water, can be machine washed and tumble dried. Rayon is commonly found in: Athletic clothing, pajamas, button down shirts, blouses, and used as a general silk substitute. All Rayon has a tendency to bleed when washed, so it should be washed with like colors or on its own. As mentioned before Viscose Rayon is a dry clean only material hence its care is much more intensive, while Modal Rayon can be machine washed. That being said, your washing machine should be put on a delicate or permanent press setting.